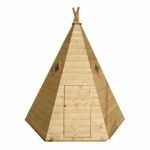 The 6 x 6 Waltons Honeypot Dutch Barn Wooden Playhouse is a truly incredible playhouse. It has lots of room for the kids to play and thanks to the high roof it will be something they can use even as they get older and bigger. The Dutch barn look of this playhouse gives it a style that makes it stand out from all the rest. With three large windows on the front it has a very welcoming and friendly look to it. Each side of the playhouse also has a window, meaning plenty of natural light can get inside. This is something that can both girls and boys will be able to have many fun years with. The playhouse is child safe and has been approved by the European Toy Standard. 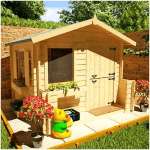 Safety features include, shatterproof styrene windows, a gap around the door to protect their fingers and just a very secure design of the whole playhouse. One of the things that makes this such a strong and long lasting structure is the thick frame that is inside and behind that smooth tongue and groove shiplap cladding. The high barn style roof has been made with impressive solid sheet boards and then has been covered with top quality sand felt to protect against the rain and snow. 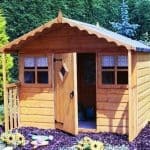 This is a very interesting playhouse in that the charm of it is that rather than trying to look like a little house or a cabin, the 6 x 6 Waltons Honeypot Dutch Barn Wooden Playhouse really does look like a barn. No ordinary barn though, the kind of barn where a rootin and tootin barn dance are held, which if your kids love to dance could be something they actually do. 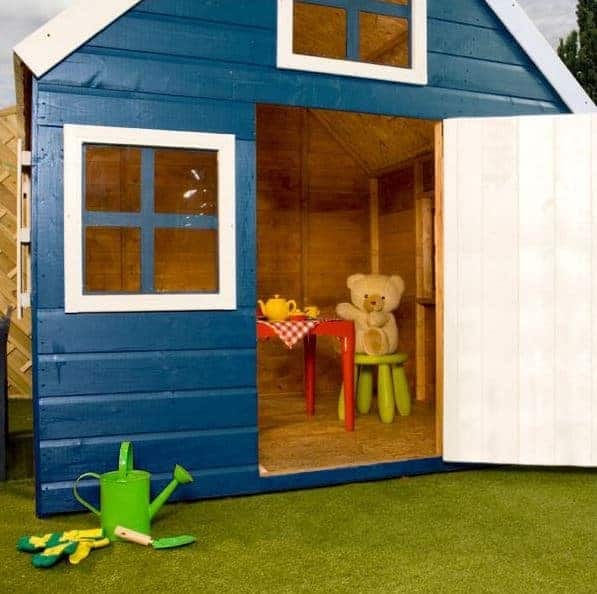 This is a very spacious playhouse with their being plenty of room for them to have fun with. The width and the depth are 5 feet 8 inches meaning they can put plenty of toys and furniture inside here. The barn style roof makes this a very high structure with the roof being just over 6 feet high. This height means that they will be able to use this for many years as they grow. The barn style roof is just fantastic and is what gives such generous headroom inside. Each section of the roof is made with a 8 mm thick, solid sheet board and the whole roof is then covered with some very heavy duty sand felt. In all the roof really is quite impressive from both an aesthetic and a design point of view. While the playhouse pictured has been painted blue, you can still see how smooth and fantastic the cladding looks. 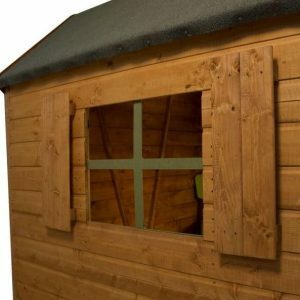 As we expected, Waltons have used 12 mm thick tongue and groove shiplap cladding as they do with their other playhouses. This makes the walls very strong, but it also gives them a look which we really like. The way the cladding is put together makes the playhouse waterproof so nothing inside is going to get ruined. Now as far as the framing goes, Waltons have really surprised us here and we mean surprised in a very good way. We thought for sure that their standard and still very impressive, 28 mm x 28 mm frame would be inside here, but instead they have gone with a thicker more robust, 45 mm x 27 mm frame to make this one very strong and long lasting structure. Waltons have used the exact same 8 mm thick solid sheet boards for the floor as they have the roof. Now this kind of boarding is fine and we have no issues with it, but we would have liked to have seen 10 mm boarding used for the floor as they have done in their other playhouses. Not a huge complaint we know and we are sure this floor will be more than strong enough to deal with the kids fun and games, but it is something worth knowing about. Despite the very colourful blue paint that the playhouse in the pictures has when it is delivered to you the timber will not be painted and have a very basic treatment that is intended just to protect it during transit and installation. To keep the timber rot free, you will have to paint it and do it shortly after you have built it. Thankfully, Waltons are giving a free tub of golden brown wood treatment with this playhouse so you will have nothing to worry about. With a fresh coat once a year, you will be amazed at how long this stays looking brand new, on the outside of course, as we are sure the kids will make a right mess on the inside. 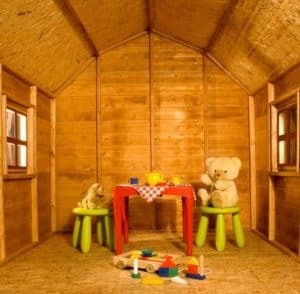 The ten year anti rot guarantee that you get with the 6 x 6 Waltons Honeypot Dutch Barn Wooden Playhouse only becomes valid once you have treated the playhouse. We love the door that is on here it is 2 feet wide and 3 feet 6 inches high, giving the kids plenty of room to get in and also allowing enough room for mum or dad to go in and drag them out when it is time for tea. The door has been very cleverly designed in that it has a small gap around the edges to prevent the kids from hurting their fingers. Also, Waltons have used very strong hinges to keep the door where it should be. This playhouse is loaded with windows so during the day it is always going to be nice and bright inside here. Rather than use glass, Waltons have gone with some very impressive, styrene windows that are shatterproof. On the front of the playhouse there are three windows with one above the door and then one each side of it, we love this look and it makes the playhouse look very inviting. On each side there is another window, but these ones have a very attractive, decorative shutter on them to give them a little bit more style. 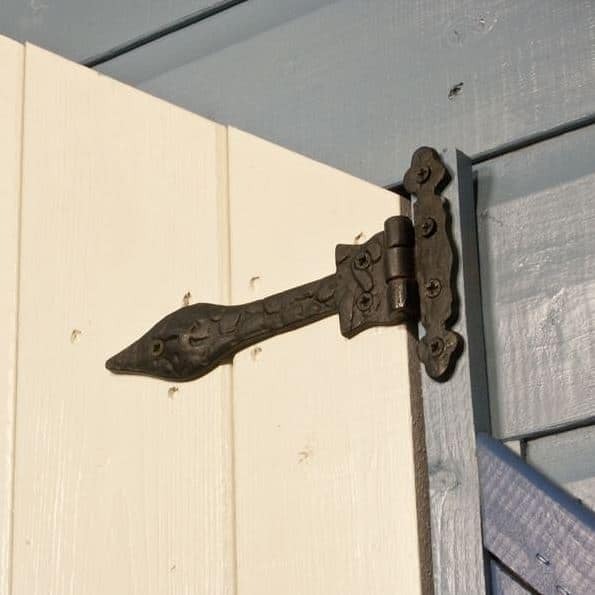 A lock on a child’s playhouse is always something of a hassle as most of the time the kids will need mum or dad to open it, taking away the come and go fun that a playhouse should be. If the still use this when they are a little older and they may want to keep a few more, pricy things inside, you then may want to consider adding some kind of pad bolt or lock. Privacy is not something you are going to get with a playhouse like this, due to the amount of windows and their location. Little children probably will not care, but as they get a little older they may not want the parents watching them play so some curtains, blinds or perhaps even just a little bit of fabric will solve this issue. Waltons playhouses never really allow for much customisation, but considering how great they look, we do not see this as a bad thing. A bright or dull colour is something that could be added if you wanted to give it a brighter or a more discreet look. 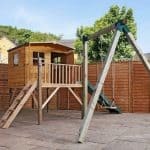 There are a number of extras to consider for this playhouse. One that we really like and we are sure the kids will as well is the wooden kitchen playset. This has a little sink, washing machine and oven for them to play with and at £49.99 we feel it is pretty reasonably priced. Superior duty felt in either charcoal or olive green can be added for £34.99, but we feel the sand felt you get is more than robust enough. 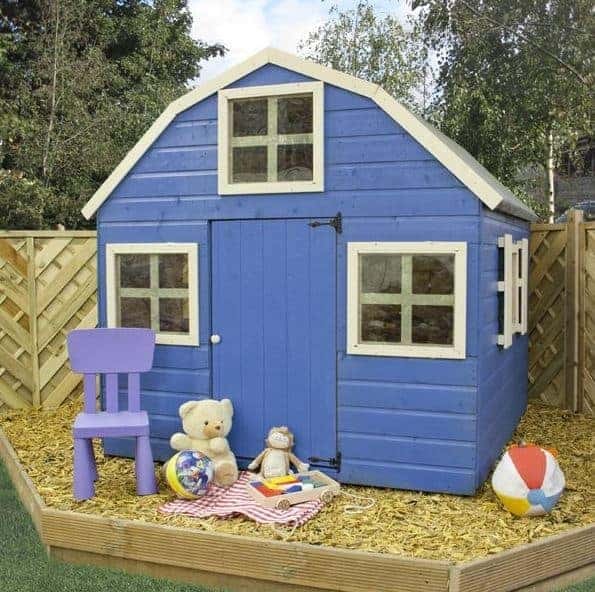 Waltons have a pro shed base which would help strengthen the floor, this is available for, £96.99 and worth thinking about if you are a little unsure of the surface you will be installing the playhouse on. They do offer an installation service, but at £199.99 it is a little high priced for our liking. Make no mistake, this is one high quality playhouse and it looks amazing, but we just wish they made the floor a little thicker like their other playhouse. Still apart from that is top quality all the way. One of the best things about this playhouse is how kids can keep on using it as they grow. Waltons clearly knew this and have used materials that are going to last a long time. We know that 6 x 6 is not huge, but when you consider the added headroom that Dutch barn style roof gives you we do feel that this is quite spacious inside. This is a two person job, but not a horrible, make you want to cry type of job. Follow the included instructions and take a break if you get frustrated and you will be fine. 4-6 hours is what Waltons say is the average time to build this and we would also agree with that. 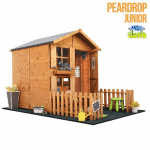 We really like this playhouse and feel that as this is something which the kids can use for years it is a very reasonable price. Final Thoughts: When we saw the first picture of the 6 x 6 Waltons Honeypot Dutch Barn Wooden Playhouse, we knew that this was a very interesting playhouse. We just love how thanks to the high roof and the design that the kids will not outgrow this. Even when they are grumpy teenagers, you could put a small sofa in here and let them use it as a place to hang out with their friends. 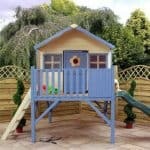 We really like this playhouse and even though we wish the floor was a little thicker it certainly is not a deal breaker. If a playhouse that is going to last many years is what you're after then this is one worth thinking about.